St. Anthony Chaplet: Make it, pray it! The Last Supper: Where's Judas? My beloved old Winnie the Pooh travel mug (don't judge me) -- which had faithfully conducted Tasty Caffeinated Beverages to my innards for years -- went on the lam last month. Which wasn't as tragic as it sounds, considering it was making Ominous Mystery Swishing Sounds when empty, suggesting some sort of hole in the insulation and therefore tossage was imminent, anyway. But still. No Tasty Caffinated Beverage Delivery Mechanism (especially during meetings!) = Sad Lisa. And lots of urgent Starbucks trips. Enter a fruitless search for a replacement. No good Pooh mugs to be found ... unless I wanted a sippy cup, which would've at least livened up said meetings. Perhaps something Catholicy? Offerings were either painfully schlocky (written by Jack Handey and designed by Clippy using Microsoft WordArt mashups) or good designs only available on standard mugs. Canada goose-themed? 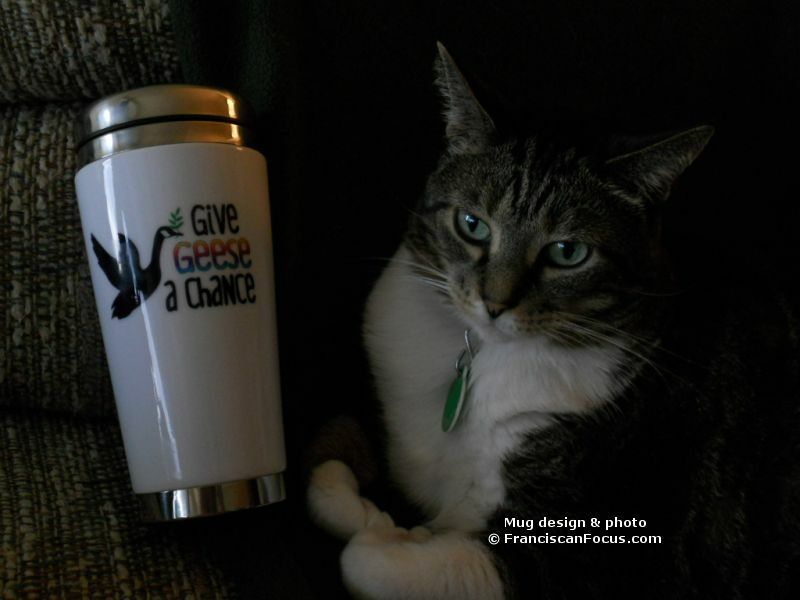 While I did find a few adorable designs at Birdorable, the one I really wanted -- Geese, Love & Understanding -- wasn't available on a travel mug style I liked. After continually comin' up goose eggs (hah! ), I finally gave up and crafted my own goosey design and produced it via CafePress. The sucker arrived today, and I'm pleased. Nice, solid feel, with bright, crisp colors. And hopefully, there'll be no Ominous Swish Of Death with this'un down the road.